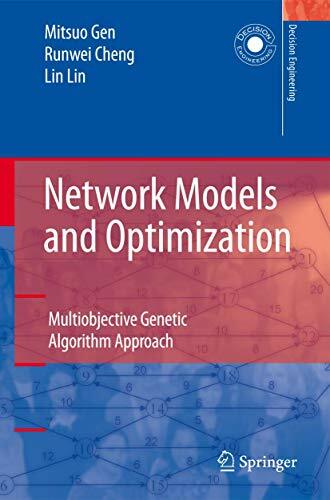 [PDF] Network Models and Optimization: Multiobjective Genetic Algorithm Approach (Decision Engineering) | Free eBooks Download - EBOOKEE! Description: Network models are critical tools in business, management, science and industry. â€œNetwork Models and Optimizationâ€ presents an insightful, comprehensive, and up-to-date treatment of multiple objective genetic algorithms to network optimization problems in many disciplines, such as engineering, computer science, operations research, transportation, telecommunication, and manufacturing. The book extensively covers algorithms and applications, including shortest path problems, minimum cost flow problems, maximum flow problems, minimum spanning tree problems, traveling salesman and postman problems, location-allocation problems, project scheduling problems, multistage-based scheduling problems, logistics network problems, communication network problem, and network models in assembly line balancing problems, and airline fleet assignment problems. The book can be used both as a student textbook and as a professional reference for practitioners who use network optimization methods to model and solve problems. No comments for "[PDF] Network Models and Optimization: Multiobjective Genetic Algorithm Approach (Decision Engineering)".